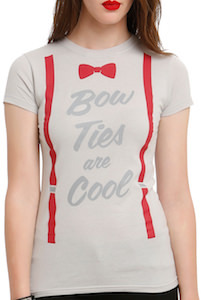 These suspenders are made for a true fan of Doctor Who. The suspenders are black and have the galaxy on it although you mainly see small starts and huge gold Dalek. The Dalek’s are all over the place witch makes these suspenders cool and scary. These Doctor Who suspenders are 1 inch wide and have metal clips for easy attachment to you clothes and they are adjustable in length so that they will be perfect for most people. 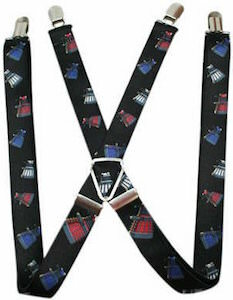 Use these Dalek suspenders to keep you pants up or just as a decorative piece as they are perfect for both. 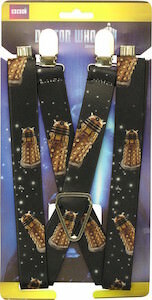 Come and get your own pair of Doctor Who Golden Dalek Suspenders. Suspenders are a great way to keep your pants up and if you are a Doctor Who fan then now you can enjoy these exploding Tardis suspenders. These suspenders are adjustable in sizes and have the famous van Gogh exploding Tardis painting all over them to make them just stunning. 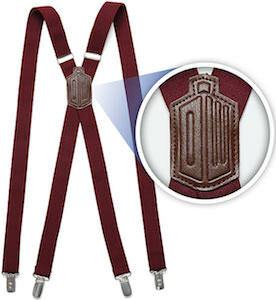 Just imagine wearing these Doctor Who suspenders with a suit of just on a pair of shorts with a fun Doctor Who t-shirt. There are so many fun occasions to use these Tardis suspenders on that they will quickly become one of your favorite Doctor Who items you own. 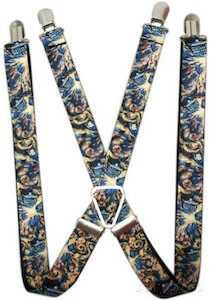 Come and take a closer look at these Doctor Who Exploding Tardis Suspenders. Belts are boring so lets replace them with some fun Doctor Who suspenders. These black suspenders will be perfect for a fan of the Doctor. On these black suspenders you can see a bunch of Dalek flying around. There are red, blue and white Dalek in different sizes just to make these suspenders just look fun. And suspenders go with pants, shorts and skirts and yes men and women can enjoy them. And of course the nice side effect is that your pants don’t fall down any more because the Dalek will keep them up. Stop wasting time and come get your Doctor Who Dalek Suspenders. Are you pants to loose? Then a belt of course is great but if you don’t like belts then maybe a pair of Doctor Who suspenders will do the trick. And we all know that suspenders are almost as cool as bow ties so you will be cool to if you wear some suspenders. These suspenders are Tardis blue and have many white squares on it and yes those are like the windows of the Tardis and besides those windows squares there are some that have the text from the Tardis top sign that says “Police Public Call Box” and then there are some squares that have the white door sign on it. 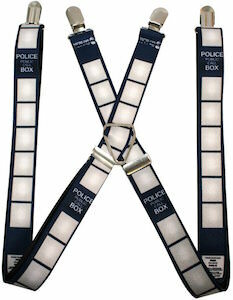 So men and women who like the Doctor come check out these Doctor Who Tardis Police Box Suspenders. Dark blue suspenders for the Doctor Who fan that has troubles keeping their pants up. 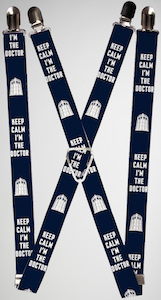 These Doctor Who suspenders have the text “Keep Calm I’m The Doctor” and a picture of the Tardis on them. The design is fun and that makes these suspenders great for any day or for the special occasions. And these Doctor Who Tardis suspenders come in one size fit most and are adjustable in size to fit you the way suspenders should. Why wear an ugly belt or show you underwear when you can just show the world that you are a whovian and keep your pants some fun suspenders. Do you want to look a bit more like Matt Smith as the 11th Doctor? How about these officially licensed suspenders? These Doctor Who suspenders are just like the 11th Doctor wears. They are burgundy red and on the back where they cross they are hold together by the Doctor Who logo. And as not every Doctor is the same size they made these suspenders in different sizes to so that they fit perfectly with the length of you body. It does not matter if you like to wear suspenders everyday or just to dress up like the Doctor. Suspenders like this are timeless just like the Doctor. So be ready to be fashionable by wearing these Doctor Who Burgundy Red Suspenders.